Diving Programs and Tour Operators in Fernando de Noronha. 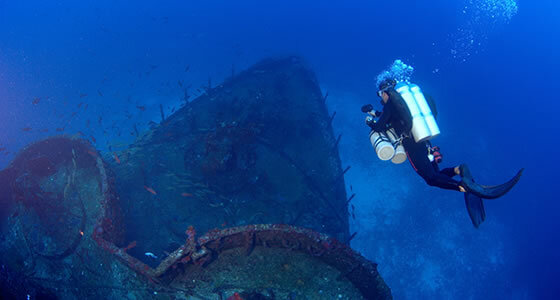 Fernando de Noronha is Diver's Mecca. Explore you Diving Program options before you go. Whether you have ever dived in your life, or want to improve on your existing skills or desire to become a diving instructor, you can find a suitable course for yourself at Fernando de Noronha. Some operators specialize in one certification program, while others offer several options, including PADI (Professional Association of Diving Instructors), SSI (Scuba Schools International), NAUI (National Association of Underwater Instructors) and PDIC (Professional Diving Instructors Corporation) certifications. The best part is being able to learn in one of the best diving locations in the world. Those who have never dived before and wish to get a glimpse into what scuba diving has to offer, can avail of a “discover” or “baptism” course, which would include a briefing on diving and equipment use and a supervised, controlled and completely safe first dive. After this, those interested have the option of signing up for a basic course to learn about safe diving techniques, leading to a certification from one of the recognized associations, allowing you to dive recreationally, anywhere in the world. Courses for children are also offered. If you intend to complete a course, never having dived before, it is advisable to understand the courses offered by the various certification boards and choose one which best suits your needs. Further, since the language might be a barrier it might be sensible to complete a basic course, including classroom sessions, in your own country, if you do not understand Portuguese fluently. If you have dived before and have completed a basic certification, you can enhance your skills at Fernando de Noronha by completing courses in cavern diving, deep diving, fish identification, rescue operations, underwater photography, ship wreck diving and several other specializations. If you have been diving before but not for a long time, you could also avail of a refresher course. At Fernando de Noronha you can pursue or further your career in diving by completing a dive instructor or dive master course, which in many cases will guarantee you a job as an instructor at one of the many diving schools here. You will also have a better understanding of what career options are available for professional divers.